Dante and Dylan are brothers and Dante is the older of the two by a couple of years, making him a little more laidback and wiser in his ways. When along came Dylan to shake him out of his reverie! "Reely bro! ", says Dylan. "How kin yoo just lie dere wen dere's skwirrels to be chased?" "Speekin' of da devil, dere's wun of da liddle jerks, now!" Out of loyalty to his brother, Dante goes along to inspect the situation. ... and basically benched himself. "As fah as I'm concerned", says Dante "dis is a spectatah sport!" Just then a little black beast sprints past Dylan at top speed – taunting him! You'll have to biggify this picture to see the squirrel. Dylan is in attack mode and Dante knows from experience that Dylan's not likely to succeed -- but it sure is fun to watch! When the slippery little sucker disappears up the tree, Dylan tries shaking it down, but to no avail. The squirrel has already planned an escape route through the tops of the trees. Dylan just can't believe his bad luck! And then he does something he really doesn't like to do -- admit his defeat! "I gives up!" he exclaims in frustration. The lesson that Dylan has to learn is that it's the thrill of the chase that provides the most excitement. Actually catching the little beast would spoil the fun -- something Dante already knows full well! We're not sure Nicki ever would learn that it's hopeless to try and chase the squirrels. LOL. LOVE the pic of Dylan "hugging" the tree. THe chase is all the fun. It would be work to actually catch it! Dante is very wise about squirrels..
Earl is a sneaky dude! We think Dylan has quite a manly fizzeek, hugging the tree. 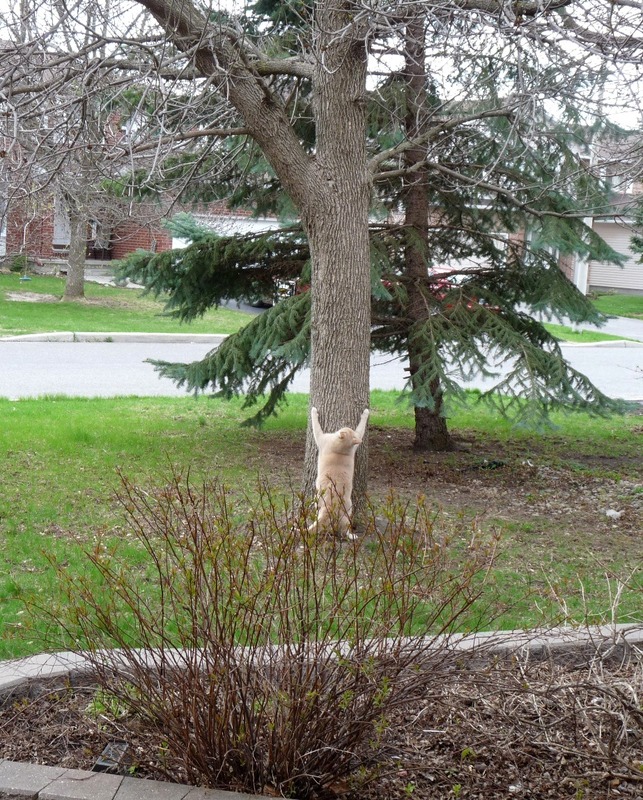 MOL, that squirrel turned Dylan into a tree hugger! Eric prefers to watch like Dante, but I like to chase them like Dylan. 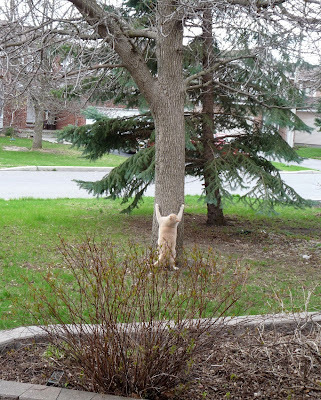 I chase them right up the trees though, but they go out on the tiny branches which would break if I followed them. WEll that sure was close Dylan. Dante, you really are much smarter to just sit and watch the excitemnt. Dylan that sure was a good try. Hope you all have a great week. MOL! Love seeing Dylan shaking the tree!